Gorgeous and washes easily. Looks more expensive than the price point. Add a touch of class to your bedroom with the Madison Park Dillon 8 Piece Jacquard Comforter Set. The luxurious textured jacquard comforter and shams flaunt a gorgeous damask medallion design with silver striations on the satin ground that add dimension to the lavish look. 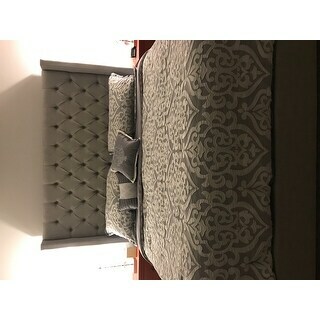 A solid grey reverse and stunning Euro shams complement the top of the bed to complete the ensemble. 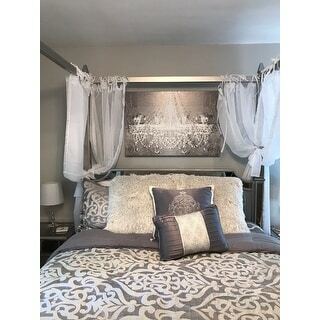 Also included are two decorative pillows that feature embroidery and cording details, while a solid silver bed skirt provides a clean and elegant finish. Overfilled for superior warmth and comfort, this jacquard comforter set offers a strikingly luxurious update to your decor. This set looks so much better in person. It is a great set. You can dress it up or down. I redid my bedroom and it works perfectly with my new decor. I LOVE this comforter set! It is a very pretty silver tone with a white trim. I bought the Queen size for our Queen mattress. My mattress is very deep, especially with an additional 2 inch mattress topper. I was worried I might need a King size comforter to cover all the sides of the mattress, but the Queen ended up just fitting! I’m extremely happy with my purchase and the cost was great. Absolutely luxurious! I am so glad I ordered this beautiful set. I have ordered from this & other department stores (I.e. jcp, bed bath & beyond) & this Madison Park set is by far the best in quality I have ever found. The comforter is thick and the pattern is raised having an embroidered feel & look. I also love that is is slightly longer on the end than other king size comforters although it is same in the sides but the length matters more for the look. I love the 2 euro shams only wish the king sizes had 3 but I was able to find another within same color scheme since this set has both light & dark gray. I say the white is is white and on euro shams/throw pillows but on the pattern seems more like a silvery light gray. I experimented with black, white & even ivory gold tones to find the best fit with my decor so you can work in ur curtains etc. I hope it lasts after washing because I absolutely love it! Beautiful comforter by Madison Park. Silver grey color is true to colors in picture. Comforter is well filled and has a thicker texture on fabric which will guarantee a long life. Good quality item! We purchased this comforter set to use for staging a condo. It is a nice light color. It comes with two regular shams, two large euro shams, two small decorative pillows, the comforter, and a bed skirt. It's a pretty good deal for what it all comes with. I appreciate the speedy delivery of my order. The comforter set is nice. The one thing that surprised me was that my white trimmed accessories did not go as well as I had hoped. The color on the main comforter is a nice gray and very off-white. It is nice, but I had to adjust my accessories to match. The small edge trim on the accent pillows is white, but not enough to help my accessories blend. Otherwise, I am happy with this set. It has a very calm and luxurious feel. I loved the design and quality of this comforter but it was not wide enough to cover my king size mattress. The design is luxurious! It has that been that gives the room a glamorous look! The shams were a bit too big for the pillows I have. May need to buy bigger pillows. Comes with bedskirt too! This set is very pretty but it STINKS. Like dust. Good quality but I am on the second dry cleaning and it still smells like dust. I can’t get past it so it will not be on my bed long. It’s also too short and needs another euro sham because two looks awkward. Just amazed at how elegant this looks in person, the picture looks way cooler toned. It’s very hard to stick this in a washer because of how big and fluffy the comforter is but it can be done. We need to buy two pillows for the big decorative square pillows next. We are more than thrilled with this comforter set. Not one single complaint. It is even better than we expected. Excellent quality. Don't think - buy this product. I love this bedding!! The picture does not due it justice! I am also thrilled with the quality. The solid gray bottom side is so soft and the damask design on top is gorgeous. I will definitely have this bedroom set for a while! So disappointed in this comforter set. I ordered the King size and the comforter is no where near the right size. It doesn’t even cover the top sheet The quality seems nice just completely too small. 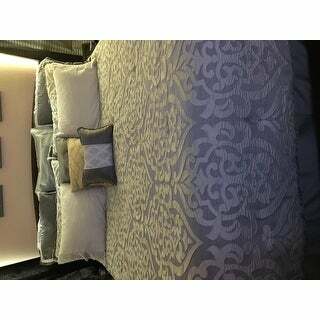 Beautiful comforter set!! Have it in our master bedroom with red accents. Perfect. Love the quality of this set. Good value for the price! This comforter set is exquisite. The silver and grey pattern is so timely. And the price is unbelievable for this quality. Although it was a little small for my high bed and thick mattress, I was still able to use it and make my guest bedroom look simply beautiful. "This says the king and California King are the exact same size. Is this true?" "I live in a very hot climate. Is this comforter breathable and not too heavy?" It looks beautiful and got great reviews! 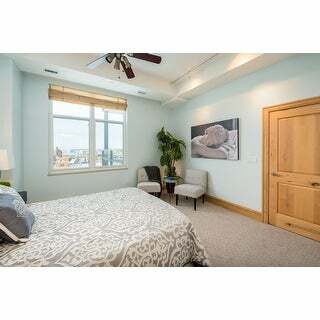 I want to create a formal and luxurious master bedroom using gray & white. I will be adding a fur throw to this set to complete the look. Reviews stated it was even more attractive in person and high quality. "Is the designs on this fabric raised as it appears on the picture and is there any sheen to it?" The white scroll design is raised. The fabric is thick and lays nice on the bed. The raised design give the comforter a 3 dimensional textured feel and has a slight sheen to it. Not super shiny like satin.